My childhood was horrendous. My father was an animal lover but as far as humans, he was a tyrant. He was a raging alcoholic, extreme racist and just plain rotten to society. He was afraid of no one and always ready for a fight. He would do so much for animals but abused and neglected his family. I’m not here to judge him or dwell on his behavior, I am sure he has his demons and I’m sad about that but I’m just trying to paint the picture. He was violent and unpredictable and I would hide in the closet, usually with one of our dogs. He would never hurt an animal so I was usually safe with one of them. My love for animals blossomed from this life I was stuck in. We always had dogs and a cat or two and I even had a pet chipmunk (he had saved several and this one would not leave when we tried to release it one day). I remember my father hand feeding several baby mice he found in the vacuum cleaner one day. To see him be so kind to a tiny baby like that and then turn around and abuse us made me feel worthless. Throughout my childhood I used to sing that song “This little light of mine, I’m gonna let it shine” in my head to remind myself that I was worthy. I don’t know where that came from but it saved me many times. Lucky for me, I moved to California when I was 8 years old with my mom. She finally left him and we brought my little dog, Muffin. Muffin was my best friend in the whole world. She was a sweet little mutt and I would have tea parties with her, dress her up and she always slept with me. She was my entire world and I learned that animals are kind, forgiving, patient and provide unconditional love without question. I believe those are also the qualities of a good parent. Through all of this I struggled to find my way in the world. I was a single mom at a very young age, dropped out of college and started working as an office assistant. I always chose jobs supporting others, never wanting to be a “boss” or an adult for that matter. It was safe and besides I never felt worthy of more than a supportive role. As I got older, I felt a tremendous desire to help animals. While I had always rescued my animal companions at the SPCA or local shelter, I had an urge to do more. I was heartbroken over the number of homeless, abused and neglected animals. Around that same time my youngest daughter, Sara, came home from school and told me about a movie she had seen. It was called Food, Inc. She told me all about the way animals are treated in the food industry and it broke my heart. Honestly, I had never really thought of where our meat came from. I feel stupid saying that now but at the time I was just moving along, living as I always had. From that day on we made a vow to stop eating meat and a few years later we took it a step further and eliminated all animal products (eggs, cheese, dairy, etc.) from our lives. One day a really cool idea came to me. I had just gone through a divorce, was as about as low as a person could get but a spark brought me back to life. I decided to invent a children’s board game so that I COULD make a difference in the lives of animals. Fourteen months later, Fur & Feathers arrived at my doorstep and it still feels like a dream. Fur & Feathers teaches children all about cats, dogs, pigs, chickens and cows. There is even a little café that features animal-friendly alternatives so that children can learn what it took me so long to realize. The animal shelter teaches them to rescue an animal and the 50 fact cards teach about spaying/neutering, taking good care of animal companions, fun facts about farm animals and much, much more. I am proud to say I had Fur & Feathers made in the USA. That was really important to me. It’s also eco-friendly. You can see it at www.AnimalMatters.com. I had to start a company because it was hard to find anyone to listen about a game that was non-violent, educational and teaches compassion towards animals, not a lot of corporations want to hear about that. They also scoffed at the made in the USA plan. So, I started Animal Matters and I’m the “boss”. As we grow I see a company that offers jobs to the elderly, disabled and abused. Office meetings will focus on empowerment and positive thinking, not numbers and money. And you can bring your animal companion to work too. No matter what your history is there is a little light that shines within you and I hope that you let it burn. You will be amazed by what you might ignite! 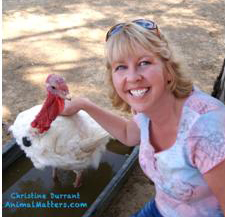 Christine Durrant is the Founder of Animal Matters, based out of Pleasant Hill, CA. An avid animal lover from childhood, Durrant desperately wanted to find a way to help curb the tremendous overpopulation and neglect of animals. She wanted to teach children the importance of spaying, neutering, adoption and also help curb the rise in obesity of children in America. Christine decided to invent a children’s board game, Fur & Feathers, in an effort to reach out to children and teach them about compassion towards animals and healthier eating habits. Fur & Feathers teaches players about spaying and neutering, animal adoption, pet care and also the choices we have when it comes to the foods we consume. Recently, she had developed a second game, Fins & Flippers. Fins & Flippers which will teach children all kinds of wonderful things about ocean animals and conservation. Christine’s approach is gentle and education based. She believes that children have the capacity to make compassionate decisions on a daily basis, and that if children learn healthy and more eco-friendly alternatives to burgers and chicken nuggets, they will carry that knowledge into adulthood. This will provide lifelong health benefits and also help preserve the planet and its precious resources. She also believes that by offering simple information, children will make the necessary connections on their own. Christine plans to continue to develop more fun, educational products that address animal issues and has many exciting products coming soon! Visit www.AnimalMatters.com to see the latest products, find some great resources for animal lovers and earth-friendly products!